Tony Qualified: 22nd, but started 42nd because he missed driver intros. Tony had a short-lived day at Texas unfortunately. He had qualified 22nd, but ended up missing driver introductions because he had been fighting a migraine all morning and had to go to the back. So Tony technically started 42nd. But it didn’t take long and he was moving that Bass Pro Chevy through the field well. It was actually good to see- because when he started at the back I was like arg…again?! He was well into the top 30 when the first caution came out – the one for Joey Logano’s spin. By the competition caution at lap 25 he had broken into the top 20. For the rest of his time on the track he ran between 15th and 19th until he spun and took a ride through the still quite wet grass. Unfortunately this tore the splitter completely off the car, it disconnected the radiator and there was other fairly terminal damage and the team decided to just hang it up for the day at lap 52. His 42nd place finish added a new stat to his stat record: Tony’s first finish outside the top-35 in 27 career Sprint Cup starts at Texas. It was a pity because he seemed to have a good car that was able to move around on the track and pass people. Other than Tony’s short lived day- it was a tiresome day at Texas don’t you think? I know that Goodyear was blaming lack of practice on things like rubs, teams pushing the envelop with air pressures but it was a lot of different drivers experiencing some problems. I left my notes at home but these are just the drivers that I remember: Joey Logano, Dale Jr, Kevin Harvick, Erik Jones, Trevor Bayne, and at least one other person I can’t think of (but it’s making my brain tired to try to think of it- lol tired? Get it?). A couple of the issues seemed like the tire was inflated but the tread came off- which to me seems like a compound issue. Race winner was Jimmie Johnson- and I can’t tell you how many times on my facebook and twitter feeds yesterday I saw this (or a similar sentiment): It’s not often you will hear me cheering for Jimmie to win but I was! I was too- but I will usually take up the team chevy driver who is closest to the lead when Tony is out of it. As a matter of fact I cheered so loudly that I scared poor Abbie who jumped off the couch where she was dozing next to me and hid. Anyway because Jimmie Johnson is no longer chase eligible- Jeff Gordon is still the only driver locked into the final four. Do you #StandWithSmoke? Showing him is as easy as 1. Donate at least $1.00 (but seriously if you can- do at least $10- because then your donation will get doubled by an anonymous donor) to the Tony Stewart Foundation atStandWithSmoke.Com 2. Download the sign (the link will be in your donation receipt) 3. Take a photo (or a short video) with your sign and either post it to the Tony Stewart Foundation facebook page or Tweet it using #StandWithSmoke and @14TSF. Let’s all show Tony Stewart we #StandWithSmoke. I love to read. That is probably evident judging by the “Amy’s NASCAR Reading list” posts I make (and for those of you wondering I will be continuing that this year and already have some posts planned) but I can’t imagine a world without reading. That is why I love the speedway reading events. I know Fontana does some reading events around their race and Texas Motor Speedway has the Speed To Read program. This year Speed To Read has partnered with Lionel Racing in a Design-A-Diecast program! How cool is that? More than 3,500 students in the seven schools that participate in the Speed To Read program will have the opportunity to use their artistic talents to design their a diecast paint scheme. 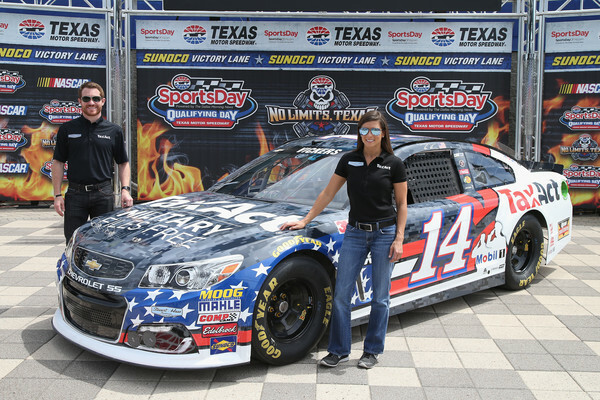 Students in grades kindergarten through fifth grade will design a NASCAR paint scheme . Winners will be picked in each of two grade categories: grades K-2 and grades 3-5. The winner will have their diecast actually produced on a 1:24 scale diecast and presented to them in an acrylic case. That is such a cool idea- I would have LOVED that as a kid! Their classmates will recieve a 1:64th Lionel branded diecast as well. The winner in each category will additionally receive tickets to the Duck Commander 500 at Texas Motor Speedway on April 11th, 2015. So not only do they receive a cool diecast as their reward but they will be heading to the race in April! How fun! From the What the Heck Files: Is Bacon the New Black?! Judging by the bacon themed food and novelty items that surround us these days, there must be some strange and growing group of bacon fanatics in the world. Who they are and where they are I do not know, and am not sure I want to know. Since everyone else I have discussed this over abundance of bacon with seems to scrunch their nose and think it as strange as I do, I am left to wonder about the people who would find such things as bacon sundaes at Denny’s, bacon bandages and bacon candy canes from Urban Outfitters, and bacon cotton candy appealing. Oh yeah, bacon cotton candy! Texas Motor Speedway is unveiling its newly created “Hawg Heaven Bacon Cotton Candy” during the NRA 500. There is even a scratch and sniff shirt to go along with this culinary creation! Executive Chef Joel Pena will prepare over 3,000 bags of “Hawg Heaven Bacon Cotton Candy” and will cook more than 300 pounds of bacon to be used as candy-coated topping to the bacon flavored candy fluff. The candy can be purchased at where else, but the Pig Rig Food Truck on the concourse between gates three and four, and in the stands by Hawg Heaven Hawkers, and at various concession stands throughout the track. I guess I really shouldn’t knock something I haven’t tried, but I just can not understand this bacon mania that is taking the country by storm. I wonder how many of you have tried a bacon delicacy or would want to try Texas’ newest treat?! If you do, let us know what you think.